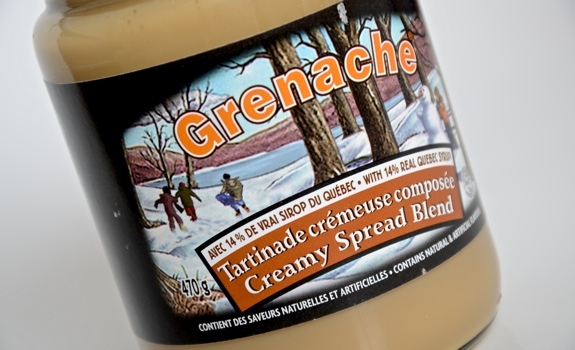 A jar of Grenache creamy maple spread, with quaint Canadian winterscape label. Another quirky find at Calgary’s fabulous Kalamata grocery store, this homely looking jar of Grenache “creamy spread” is mysterious, yet sounds yummy. It’s made by Smucker Foods of Canada, so it’s not some tiny artisanal product. And yet, this is the first time I’ve seen it. When I think Grenache, I think of the common grape variety used to make wine. After a bit of googling, I learned there are other Grenache spreads out there (often involving Caramel), and that it’s likely one of those Quebec things that doesn’t make it far out of the province. Any Ontarian readers care to comment? Have you seen this in your neck of the woods? This scoop of Grenache clearly wants to slide down the spoon and onto the floor. The Pitch: “Creamy Spread Blend,” whatever that means. “With 14% real Quebec syrup.” Maple syrup is on the ingredients list right after glucose-fructose and sugar. The Totally Unrelated Aside: I’m keenly aware of this little decimal detail. During my early years of French immersion, all my math classes were in French; as a result, so far as young me knew, everyone in the world used commas as decimal points, and periods between groups of three digits. In practical terms, my head wanted it to be $1.000,00 instead of $1,000.00. Once I got to high school, math class switched to English, and my teachers repeatedly expressed their frustration at my mixing up commas and periods. It’s one of those strange Canadian bilingual childhood things. I’m sure others had the same experience. The Taste: Let’s break this into two categories, shall we? 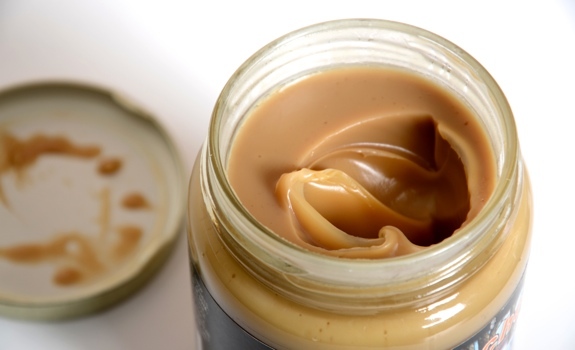 On its own, eaten from a spoon: Open the jar and BAM! Maple aroma. Very soft and velvety texture. It’s not liquid, but the scoop of Grenache paste wants to slide off the spoon. Extremely sweet, with a maple and creamy chemical taste. It’s hard to pin down, but I can taste a hint of that flavour you get when you accidentally get a bit of shampoo lather in your mouth. It ruins an otherwise appealing flavour. On a fresh slice of bread: Not bad. The maple and bread (yeast flavours, especially) get along famously. It’s sort of like eating French toast with maple syrup, but without the egg-coating and cooking time. With other flavours to mask it, the chemical note isn’t as strong. A jar of Grenache, with a bit missing. 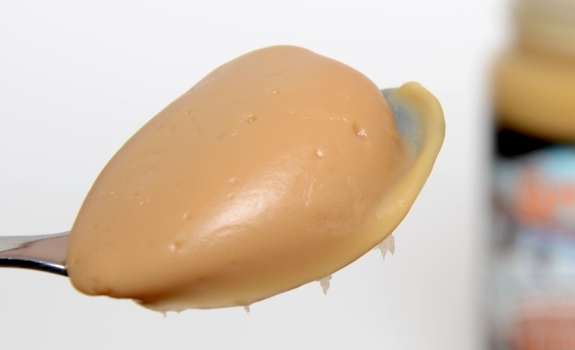 Note the soft, creamy texture. Cost: $2.99 for a 470 gram jar at Kalamata grocery in Calgary. Availability: First I’ve seen it, but it must be available elsewhere. Nutrition? : Per 1 tablespoon (20 grams): 70 calories, 1.5 grams of fat, 35 mg of sodium, 0 grams of fibre, 0.2 grams of protein. The verdict: I can see why people like it. If you can’t get enough maple in your life, this might help. I’m sure some folks searching for “Grenache,” “maple” and “Calgary” will be delighted to know they can find their fix at Kalamata. Some Grenache, spread on a slice of yummy Prairie Mill bread. That looks tasty, I have never seen anything like that before! someone gave me some as a gift and I love it. Where can I order some? I remember relatives going to Canada (Quebec province) and bringing some home years ago. So, I contacted Smuckers, as the article indicates, Smuckers of Canada makes it. Smuckers said that there is no way to get it in the U.S., you cannot even buy it from Smuckers Canada and have it shipped. I never really found out why, but there must be something in it that is not USDA approved or something for importation here. Anyone who knows the answer and a solution would be great! I have gone recently to Quebec province and found the Smucker’s Grenache very commonly in grocery stores as well as in the food sections of the Walmarts in Canada. The container looks like a small yellow butter/margarine tub, not at all like the one in this article, so I am not convinced that the one in the article is from Smuckers. I remember many years ago getting Grenache made in Canada and it was never made by Smuckers. What I found from Smuckers seems to be a farce. They are making “Grenache” with no maple in it, but rather there are various flavors such as chocolate or caramel. So, it is pretty much the same as the spreads or dips here in the U.S. So, I am not sure that calling those Grenache is appropriate. I am still on the hunt for the old fashioned, traditional Grenache. Bought it all the time at Metro formerly Loeb in Orleans Ontario. Finished my jar a few months ago, it’s nowhere to be found now??? Grenache, was a product my mom bought. I am now an adult and don,t eat sugary much. But did buy a jar at xmas, just for old time’s sake. The product is just not what it used to be. Grenache was bought by Smucker’s, which has closed the original Quebec plant in 2013. Production was transfered to Berthelet, pending the manufacturing of the product in the states. In the US Smuckers is knowed to opposed natural ingredients in it’s product. They have spearheaded opposition to bills, for the identification of all artificial ingredients in food in that country. No wonder the product texture has so much changed for my childhood treat. I have been using this product for a long time when it was I am dis=appointed and would appreciate your help in finding some elsewhere. CAN YOU PLEASE PUT THAT SMOOTH, VELVETY MAPLE SPREAD BACK ON THE SHELVES OF PROVIGO STORES AND MANY MORE STORES. IT IS THE BEST SPREAD THAT GRENACHE EVER MADE. THE BEST IN THE WORLD. I hope that Grenache Maple spread will be back on the shelves of my grocery store very soon. Why the shortage of product? Please have it back very soon. I am an addict I am proud to say!!! Grenache Creamy spread blend has been the best spread ever and have been used by me many years. It now has been reported to me by IGA store in LaSarre, Que. that they can,t get it anymore.I am disapointed and mad at your company for disrupting my ccustom. This is my 2nd message and i want an answer as to why or where i can still buy this product. Wake up Smuckers, I want an answer to my inquiries. How would you care to have all your products blacklisted? Je suis de Laval,Qc. 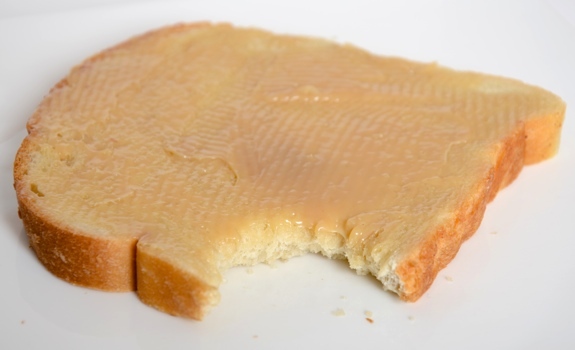 Je raffolle de ce beurre d’érable qui est une merveille au goût.Je suis déçue de ne plus pouvoir en trouver à nulle part. C’était ma tartinade préférée depuis mon enfance. J’aimerais savoir pourquoi cette merveille a disparue des tablettes des épiceries. Je vois que je ne suis pas le seul à être en manque de votre merveilleuse tartinade à l’érable. Vous nous avez fait gouter à cette sublime préparation, vous avez maintenant une responsabilité sociale de continuer à nous fournir cette ¨presque drogue¨. Devra-t-on aller sur le marché noir pour s’en procurer et à quel prix. Imaginez un peu la criminalité qui pourrait en découler !!! Voulez vous vraiment avoir ça sur la conscience ? Bonjour très chers amateurs de Grenache de tartinade crémeuse a l’érable. Nous sommes totalement désespérées mes filles et moi, il n’y a pas une semaine qui passe sans regarder dans les rayons d’épicerie a fin de découvrir cette denrée rare qui nous est si chère a nos papilles gustatives. Comment ce fait-il qu’au Québec royaume de l’érable dons des milliers de 45 gallons sont engrangés dans la Beauce que la Compagnie ne puisse plus en produire ou que font-ils avec cette sublime et délicieuse tartinade? l’exporte t-il? Nous pauvres consommateurs ne pouvons plus attendre s.v.p remettez le produit sur le marcher le plus tôt possible. J’achetais cette tartinade très régulièrement et je fournissais aussi des amis du Nouveau-Brunswick qui me l’avaient fait connaître. Grenache a été achetée par Smuckers et ces derniers ont décidé de ne plus cuisiner ce produit; il est donc disparu des tablettes de toutes les épiceries du Québec. Je souhaite ardemment que Smuckers changent d’idée et produisent cette tartinade à l’érable très bientôt. C’est la meilleure qui existait à un prix très raisonnable. CAN YOU PLEASE PUT THAT SMOOTH, VELVETY MAPLE SPREAD BACK ON THE SHELVES OF ONTARIO STORES IT IS THE BEST. WHERE CAN I ORDER SOME?